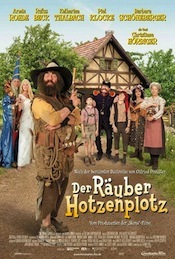 Based on the beloved children's story by writer/illustrator Otfried Preußler, The Robber Hotzenplotz tells the story of two boys who set out to track down the villain who stole their grandmother's coffee mill. A gentle fantasy in the tradition of Chitty-Chitty Bang-Bang, this is the second adaptation of the novel; the first starred Gert Fröbe as the title character. Academy Award winning composer Nicola Piovani once again demonstrates the mastery of playful melody that brought him worldwide acclaim for his work on Roberto Benigni's “Life Is Beautiful”. Driven by jaunty xylophone percussion, and backed by delicate work on accordion and strings or piano, the themes range from curious and whimsical to emphatic. The main Hotzenplotz theme verges on Bavarian polka, a nod to the roots of the story's titular character, without breaking from Piovani's more march-like arrangement. Whether boisterous or restrained, the score exhibits the similar sort of teasing interaction with the audience as Prokofiev's Peter and the Wolf. Quirky and peaceful, featuring fife and trumpet. A zany, playful melody played by xylophone and whistling. A light, whimsical piccolo and glockenspiel melody moves into a lumbering trumpet and clarinet section at 0:28. A man sings in German over a whimsical, playful background. Flute and glockenspiel play a light, playful melody. Low-key and quaint, featuring a piano melody over a whimsical background. A playful melody in strings interspersed with clarinet. Moves into an urgent, jaunty section featuring xylophone. A glockenspiel melody over a light atmosphere creates a pleasant, whimsical mood. Begins with a slow clarinet and glockenspiel melody. Moves into an upbeat, cheery section at 0:51 with xylophone and trumpet. Piccolo and glockenspiel play a merry, playful melody. A whimsical, playful melody is passed between fife, glockenspiel, and trumpet.